After breakfast drive to Gulmarg "Meadow of Flowers" 2730 Mts. above sea level. The distance of 60 kms will be covered in about 2 hrs. Gulmarg has one of the best Ski slopes in the world and highest golf course of the world with 18 holes. One can also have the view of Nanga Parbhat if weather permits. The view enroute from Tangmarg to Gulmarg is fascinating. One can also have a short trek upto Khilanmarg which can be covered in about 3 to 4 hrs or enjoy the scenic view of Kongdori on a Cable Car Known as Gondola (on direct pay basis). Drive back to Srinagar, Overnight stay in hotel. In the morning after breakfast proceed to Kargil via Sonmarg and Zojila Pass and Drass (Drass is inhabited a 2nd Coldest Place in the World after Siberia). On the way to Kargil, Visit Kargil war Memorial located at Drass. On Arrival in Kargil Check in HotelIn the morning after breakfast proceed to Kargil via Sonmarg and Zojila Pass and Drass (Drass is inhabited a 2nd Coldest Place in the World after Siberia). On the way to Kargil, Visit Kargil war Memorial located at Drass. On Arrival in Kargil Check in Hotel. Overnight stay at Hotel. In the morning after breakfast Proceed to Leh, on the way visit Lamayuru Monastry, it is Tibetan Buddhist Monastry and is one of the largest and oldest gompas in Ladakh, with a population of around 150permanent monks resident. Mulbekh is located before Lamayuru, where right next to the high way you will see a 9m tall rock carved Buddha Statue. Arrive Leh, proceed to hotel. Overnight stay in the Hotel. In the morning after breakfast Proceed to Pangong through Changla Pass 17,350 ft. This Pass is third Highest Motorable road in the world. 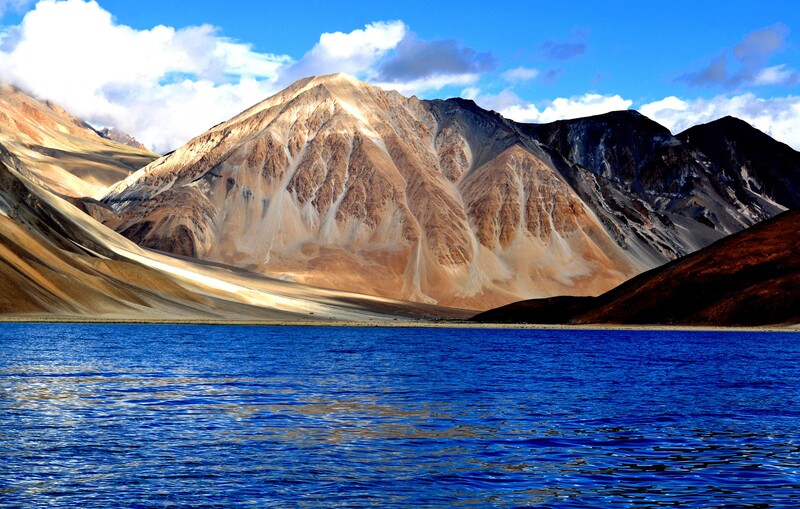 After that visit to Pangong Lake, enjoy the color changing lake and the sun set on the banks of lake. Also enjoy the most famous 3 Idiots movie point. Dinner and Overnight at Pangong. In the morning after breakfast Proceed back to Leh. Free day for Acclimatize. Dinner and Overnight at Hotel. In the morning after breakfast Proceed to Nubra Valley, It is a tri-armed valley located to the north east of Ladakh valley. there you go through world's highest motorable pass, The Khardung La. Also enjoy the cold desert that surrounds it with Bactrian camels and its breath-taking natural beauty. The average altitude of the valley is about 10,000 ft. i.e. 3048 metres above the sea level. The drive is along Shyok River and its river deserts and Oasis. Dinner and Overnight at Hunder. In the morning after breakfast Proceed back to Leh. Free day for Acclimatize. Dinner and Overnight at Leh. After breakfast on time drive to Airport for onward destination. Non AC Tempo Traveler for transfers as per Itinerary.